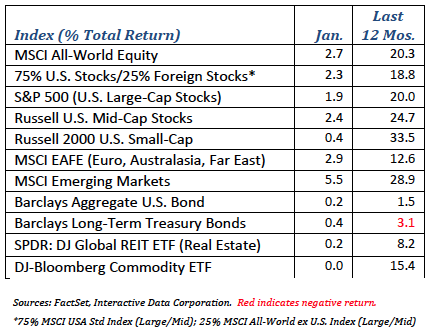 In January, the U.S. equity market continued its momentum from the 2016 year-end rally. Large cap stocks gained 1.9% and the Dow Jones Industrial Average finally crossed the symbolic 20,000 level. Some of the so-called “Trumpflation” trades retreated in January. Bond prices recovered some previously lost ground as the yield on the 10-year Treasury fell. Fears of increased protectionism and adverse effects of a stronger dollar abated, helping emerging markets and international stocks outperform the S&P 500. After leading the market higher post-election, U.S.-centric small-cap stocks underperformed to start 2017. If you paid attention to the financial media in January, there was a singular focus on President Donald Trump. Whether the market opened up or down on any particular day was generally due to the latest tweet from the White House. The transition of power every four or eight years often signifies a shift in the U.S. stance towards its global allies and adversaries, as well as a re-direction of domestic policies. It’s not that the policies implemented from the highest political office in the country are unimportant for investors. It is, however, unusual for a sitting President to single-out and pressure individual companies. But with the media hyper-focused on every pronouncement, investors are left high and dry when it comes to helpful perspective on the financial markets and what all this really means for portfolio strategy. Many of the new President’s policies are pro-growth. A large infrastructure plan and corporate tax reform are supportive for corporate profits and jobs and, by extension, the stock market. Under Trump, the corporate tax rate could fall to 15% while foreign profits could be repatriated at a lower rate as well. Interest cost on debt might no longer be deductible, serving as a counterpoint to new rules allowing quicker write-off of corporate investments in property, plant, and equipment. These are some of the most significant proposals to keep U.S. firms spending, manufacturing, and hiring. Other policies are potentially growth negative. President Trump’s rhetoric on trade has the potential to reshape the financial market picture. It’s no surprise that Trump has moved against both NAFTA and the TPP, (Trans-Pacific Partnership). Railing against these big trade deals was a centerpiece of his campaign promise to bring back jobs from overseas. A border tax imposed on goods imported from abroad threatens to increase the cost of goods produced outside the United States, increase the value of the U.S. dollar, and eventually reduce our competitiveness in the global market. A stronger dollar can also serve as a drag on performance of non-dollar investments such as emerging market or international equities. Mexico, with 120 million people, is a sizeable economy and our third largest trading partner after Canada and China. Still, a trade war with Mexico will not likely do irreparable harm to the U.S. economy, although there could be unintended consequences to having an economically failed state next door. The likely result might be a new wave of illegal migration to the U.S., the opposite of what the new border wall is intended to achieve. While Mexico cannot win a trade war with the U.S., picking a fight with the world’s second largest economy is more problematic. After a massive stimulus that helped pull the global economy out of the 2008-09 recession, China is now heavily dependent on corporate and consumer debt. A significant shift in Chinese trade has the potential to rattle not just the U.S. but also the global economy. Can a hardline “America first” policy be taken in an interdependent world economy without unintended consequences? Hopefully, the new administration will settle for a largely symbolic victory over China and move on. Much of this is uncertain as the new administration consists of many new and untested faces running the government. That may be the most challenging aspect of this transition of power, as financial markets yearn for certainty more than anything. So far, the first wall out of the Trump administration has been built out of uncertainty and apprehension – the proverbial wall the markets regularly ascend. Amid all the political noise, it is important to keep an eye on the fundamental picture. Buried under the political coverage is the fact that the U.S. and broader global economies continue to improve. The U.S. economy added 227,000 jobs in January – well-above the 100,000 rate economists think is needed to maintain the unemployment rate at current low levels. Surveys of manufacturing and service sectors point to increased domestic and global activity. Small business optimism and consumer confidence also improved over the past year, leading to potentially more investment and consumer spending. Corporate profits are improving after taking a brief dip in early 2016 as low oil prices weighed on the energy sector. A mercurial new president, big changes in Washington, and rising global tensions – when the world at times seems so uncertain, how should you go about investing your money? Unfortunately, reading the morning papers and watching CNBC is not particularly helpful in making profitable long-term investment decisions. Can investors approach the current market environment in a way that combines fundamental lessons from the past with knowledge of new challenges the world faces? The goal, we believe, is to build portfolios that correctly balance return opportunities with careful risk management. What should investors do right now? Probably not much. Most of the new administration’s policies only impact our views at the margin and have not yet, at least, altered our long-term outlook. Economic growth continues to persist in the face of uncertainty and geo-political risk. We are maintaining course, holding a moderate allocation to international stocks. Diversifying some U.S. dollar exposure remains prudent in our view, and valuations are certainly more attractive abroad for investors in it for the long haul. We remain cautious with bonds as the market continues to potentially underprice inflation. The Federal Reserve has signaled that three rate hikes are appropriate if the economy stays on track. Bond markets have yet to fully discount this view. We prefer to keep interest rate exposure less than the broad market. Risks abound, and maintaining liquidity in your portfolio provides flexibility to make adjustments should the new administration stumble or if the investment backdrop abruptly changes. Layered on top of our stock and bond strategies is a focus on quality. After years of low interest rates, investors have flocked to lower-quality bonds in search of higher yields. High yielding, lower-quality stocks have also benefited from this trend. With the potential for increased volatility and higher interest rates, now is not the time to reach too far for yield.